Every once in a while you take a dusting. One might say that Ted Cruz and John Kasich both took dustings from Donald Trump who claims not simply to have won but to have knocked them off. Cruz in particular went toe to toe with Trump until he sustained the big knockout in Indiana. 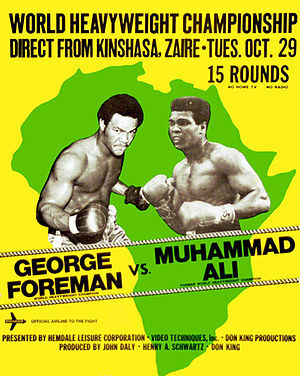 George Foreman took a major dusting from Ali in the famous Rumble in the Jungle. Sometimes getting totally routed and having all your dreams smashed can lead to a resurrection. That is what happened to George Foreman. Many people think that the George Foreman we see on TV today, cheerily delivering commercials for InventHelp, was the product of that fateful fight. If you remember, the persona Foreman conveyed throughout much of his fight career was sullen and brooding. He came to fight and he showed it. The reborn George Foreman still came to fight, but he was a delight—a little like his arch rival Ali. Back in l997, after losing in a ridiculous decision to Shannon Briggs, who was not in his league, Foreman had no harsh words for the fighter or the judges. He used the opportunity of a post fight interview to talk about his famous grill. It was both a riot and inspirational. Interestingly Trump opened his arms to both his rivals after roundly defeating them. About Cruz he remarked that he didn’t know what Cruz felt about him, but gave credit to his opponent for being "one hell of a competitor." Whether he really means it or not, he's offered Kasich crack at the VP slot ("Donald Trump's VP Shortlist Isn't As Crazy As It Sounds," Slate, 4/12/16) But what will happen to Cruz, Kassich and the other top runners in the bitterly contested Republican primary— Chris Christie, Carly Fiorina, Marco Rubio and Ben Carson? Will they rise from the ashes or will their dust simply turn to dust?